The Secretary of the Interior (referred to in this section as the ``Secretary'') shall conduct a special resource study regarding each area, site, and issue identified in subsection (b) to evaluate--(5) Flushing Remonstrance, New York.--The John Bowne House, located at 3701 Bowne Street, Queens, New York, the Friends Meeting House located at 137-17 Northern Boulevard, Queens, New York, and other resources in the vicinity of Flushing, New York, relating to the history of religious freedom during the era of the signing of the Flushing Remonstrance. 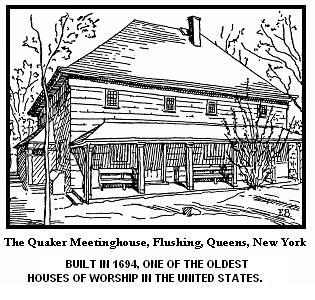 The Park Service plans to use internal standards to determine whether the Bowne House and our Quaker Meetinghouse meet the criteria to be included in the nation’s park system. The criteria will be based on the sites meeting national significance, suitability, and feasibility, as well as the need for National Park Service management. The study, which will cost between $200,000 and $300,000, could lead to the two locations becoming either National Historic Parks or National Historic Sites. To read more, visit the Forum News and the Daily News.